Jen Treger is Community Health and Safety Specialist in the Division of Student Affairs at UMBC. Sometimes social change looks like this: Members of a community preparing to leap into action to meet a threat to some of its members. That’s the idea behind UMBC’s Green Dot program. UMBC students learn to confront relationship violence and to promote a culture that says violence is not OK in our community. College is a time to learn, to grow, to try new things and to expand horizons. None of us wants any student to experience any form of violence. But violence does occur. The Green Dot program teaches students how to be active bystanders, react to situations that have the potential for violence, and proactively build a culture that does not tolerate violence. The program’s core values are: most people are fundamentally good and don’t want to hurt others; violence prevention requires practical skills; men and women need to work together to reduce violence; and hope is necessary for success. I have been in a manipulative and potentially violent relationship and I’d like to prevent others from experiencing what’s happened to me. A very close family member of mine was a victim of relationship violence. Hearing about it after it was over left me feeling hopeless and as if I could have helped, but I didn’t. This program will give me the tools I need to help others if they are ever in a similar situation. My best friend was involved in a highly toxic relationship for over a year. There were signs: bruises, comments and even one time a full-on hand print. I did not know how to stop it or even bring it up. It wasn’t until the university got involved that I realized how helpless I had been. My parents are in an emotionally and verbally violent relationship as far back as I can remember. Students completing the program have said they feel more confident about intervening to prevent violence, more attuned to the warning signs, and more certain that they can make a significant impact on campus. Together, let’s create a culture on our campus where we do not accept violence and we look out for our each other. 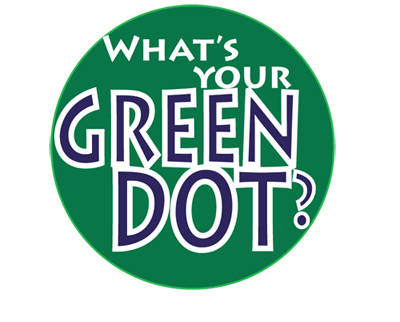 UMBC’s Green Dot program will have a launch event on Friday, September 21, 2012, 11:00 a.m.–2:00 p.m. on The Commons’ Main Street, and UMBC President Freeman Hrabowski and Green Dot-trained students will speak about the program from noon to 12:30 p.m. in the Sports Zone. Contact me any time to sign up for training, ask questions or invite me to speak to a campus group about the program. Contact the author, Jen Treger, at jtreger@umbc.edu. Keep up with the UMBC Green Dot program by liking its Facebook page.